The era of big data has arrived, bringing with it more sophisticated ways to capture our interests, preferences, and behaviors. Whether it’s recommending what video you’d like to watch next online, suggesting a new connection on LinkedIn, or simply reminding you it’s probably time to purchase more laundry detergent, data has become a major driver in how we interact with brands and companies in our daily lives. Yet for many higher education professionals, data remains an elusive goal. Within individual departments – from enrollment management and admissions to student services, academic programs, and alumni relations – student data sits in silos either blocked by incompatible databases or by simply a lack of collaboration across keepers of the data. The result? A major blind spot that can hurt your ability to support your students’ journey from the moment they inquire through enrollment and graduation, and beyond. “Today’s universities aren’t challenged by a lack of data,” says Rob Humphrey, Senior Account Executive for the Higher Education vertical at LinkedIn. “The challenge is that there isn’t a single clearinghouse of student information that can be analyzed for greater insights into students’ needs and expectations.” To get a more accurate big picture for your school or university, LinkedIn’s new The Power of the Connected School offers key strategies and best practices to leverage the premier professional networking platform to harness your data, engage your key audiences, and ultimately better serve your students. Whether you work in admissions or student services, whether you’re a faculty member or career services practitioner, a successful student relationship always begins with quality engagement. With LinkedIn, you have a wide range of opportunities to engage with students at every step of their journey, providing them with the personalized support they need and expect to become a thriving member of your alumni base. Most schools and universities begin with a University Page to connect with prospective and current students, highlight alumni accomplishments, celebrate school milestones, and promote networking events. Supporting your dean or university president with his or her own blog on LinkedIn is another way to highlight your areas of leadership. 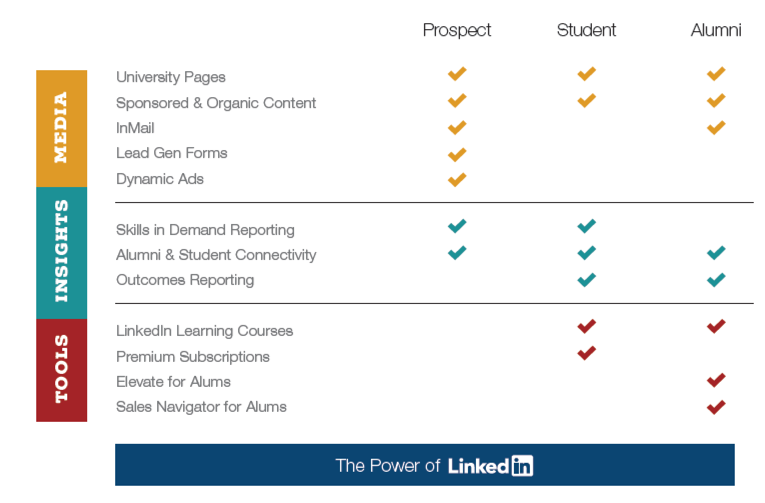 Even students can serve as publishers on LinkedIn, serving as proud school ambassadors while connecting with potential employers. For admissions, which geographic areas deliver the most students? For career services, what are the most in-demand skill sets today and what is trending for tomorrow? For alumni relations, where are the most popular industries and companies for your graduates? Already, LinkedIn offers insight tags for valuable insights about your website visitors and your ad campaigns, including demographic reporting and conversion tracking. According to Amilhussin, LinkedIn envisions a dashboard in the future that can capture, sort, and make accessible data across departments in standardized reports. What if you could identify where your alumni live, in what industries they work, and for what company? You can with LinkedIn’s Alumni Tool. If you work in career services, you may be familiar with this tool and using it to connect current students with potential employers. But what if you work in alumni relations? This would be an effective tool for supporting class reunions or identifying potential donors. And if you work in academic programs? This could be a valuable resource to evaluate new trends in career paths or even update curriculum. 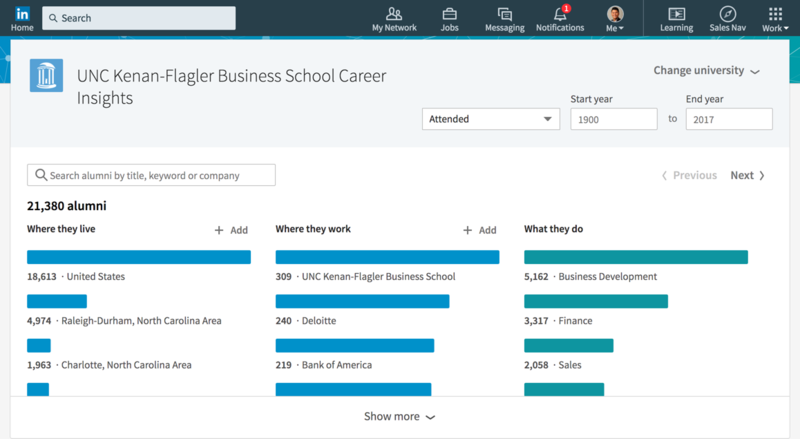 The Alumni Tool is just one of many featured tools that are available to your school through LinkedIn. The key to your success is to start having conversations with your colleagues to make sure you’re aware of all the invaluable insights available to connect you with your students. 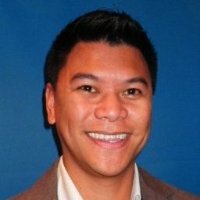 Are you serious about breaking through your school or university’s silos? Share The Power of the Connected School with your departments to spark conversations about how your teams can work together to coordinate university-wide efforts on the LinkedIn platform. Today, LinkedIn members number more than 500 million professionals. That’s more than one-half of the 600 million professionals on the planet. Imagine what insights you can learn from them.